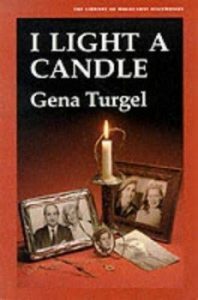 Gena Turgel, who survived the Kraków ghetto, a death march, Auschwitz and Bergen-Belsen has died aged 95. 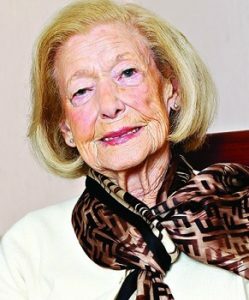 She spent much of her life after the war teaching British schoolchildren about the horrors of the Holocaust. Born 1 February 1923 in Krakow, Poland, she lived in the ghetto for two years with her mother and four siblings. One brother was shot by the SS; another fled and never seen again; a sister and her husband were also shot. Another sister was lost after she and her mother were transferred to the camps in late 1944. In Bergen-Belsen she helped care for Anne Frank, who was dying from typhus. At her liberation she met and shortly after married a British soldier who was there. Her memoir, I Light a Candle, was published in 1987. 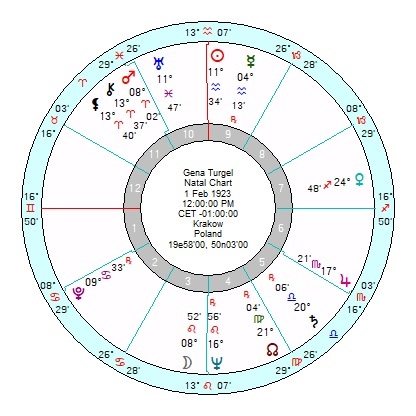 She was a Sun Aquarius opposition Neptune and square Jupiter so would have had faith and optimism to pull her through. She also had a ‘healing’ Water Grand Trine of Jupiter trine Uranus trine Pluto. She was described by those who knew her as ‘a blessing and an inspiration.’ Her Mars in pro-active Aries was square Pluto, making her resourceful in crisis and utterly determined. Her ‘seeking soul’ 7th Harmonic was strongly aspected; as was her 16H which can indicate extreme stamina in difficult circumstances.